The Europe Direct Information Centre of Győr-Moson-Sopron Country, the Centre for European Studies of Széchenyi István University and the Győr Office of Antall József Knowledge Centre organized an event entitled "Az Európai Bizottság, mint az integráció motorja: érdekek és kihívások. 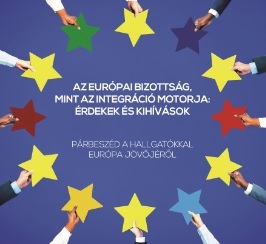 Párbeszéd a hallgatókkal Európa jövőjéről" [’The European Commission as the engine of integration: interests and challenges. Discussion with students on the future of Europe’] on 6 November 2017 in the Deák Room (Faculty of Law building). In the frame of the event, Gábor Zupkó, Head of the European Commission Representation in Hungary introduced the work of the main EU institution, the challenges it is facing and its representation in Hungary. The language of the programme was Hungarian. Poster of the event is available here.